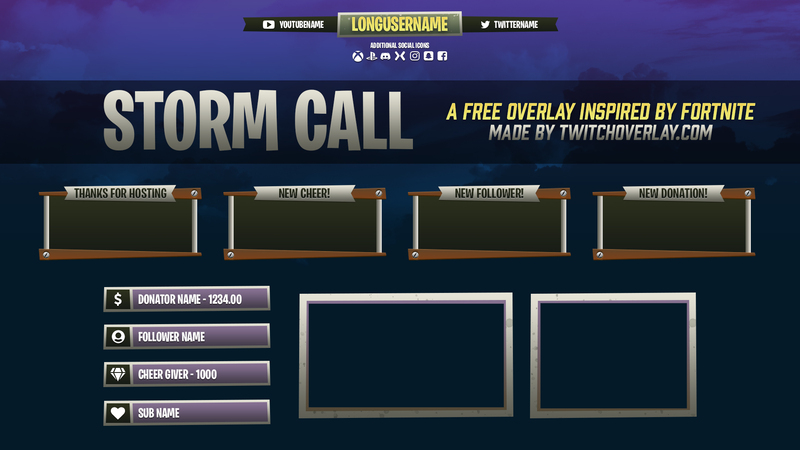 Storm Call is a free fortnite overlay for your Twitch, Mixer, and YouTube streams inspired by the game’s style and art. This download features muted colours and stylisitic flair, while staying true to the vibe laid down by Epic, also won’t interfere in your pursuit of that victory royale. Full run-down of the files included is under the Download Details section, but to summarise here the header is split into sections, meaning you can choose to leave in/out the social panels to the left and right of the main section. Also included are 4 stream alerts, 4 panels, 2 webcam size variations (for 4:3 and 16:9 webcams), and a whole bunch of social media icons for use in the header, or anywhere you feel like.